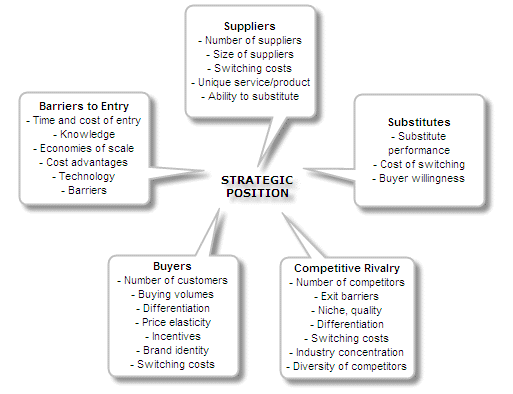 Porter's competitive five forces model is probably one of the most commonly used business strategy tools and has proven its usefulness in numerous situations. When exploring strategic management models, you also might want to check out the BCG matrix, SWOT analysis, IFE matrix, and SPACE matrix models. Why would I need to use Porter's Five Forces model? In general, any CEO or a strategic business manager is trying to steer his or her business in a direction where the business will develop an edge over rival firms. Michael Porter's model of Five Forces can be used to better understand the industry context in which the firm operates. Porter's Five Forces model is a strategy tool that is used to analyze attractiveness of an industry structure. What is good about Porter's Five Forces model? Porter has the ability to represent complex concepts in relatively easily accessible formats. His book about the Five Forces model is written in a very easy and understandable language. Even though his model is backed up by some complex model, the model itself is simple and easily comprehensible at all levels. Porter's Five Forces model provides suggested points under each main heading, by which you can develop a broad and sophisticated analysis of competitive position. This can be then used when creating strategy, plans, or making investment decisions about your business or organization. Does Porter's Five Forces model really work? Theoreticians have different view on this. While some agree that Porter's Five Forces model is the ultimate explanation of how world works, others disagree. It depends in what time frame we judge the state of the facts. Even Michael Porter himself acknowledges that time is of essence when it comes to how his forces interact with each other. Numerous economic studies have shown that different industries can sustain different levels of profitability. This can be attributed to differences in industry structures. What is the basic idea behind Porter's Five Forces model? Some later economists also consider government as the sixth force in this model. The threat of forward integration is also an important factor here. Finally, we have to analyze the level of competition between existing players in the industry. Rivalry is the fifth factor in the Five Forces model but probably the one with the most attention. What are the assumptions behind the Five Forces model? From the risk-return perspective, Five Forces model indirectly implies that risk-adjusted rates of return should be constant across firms and industries. How can I analyze my business from inside? Porter's Five Forces model views the business from outside. It focuses on assessing competitive position within industry. If you wanted to analyze your firm from within, you might want to consider the SWOT model. The SWOT model has some aspects of external view as well but complements Porter's Five Forces model in the internal view. Another model that you might want to consider is the Balanced Scorecard and IFE/EFE matrix. Michael Porter is a professor at Harvard Business School and is a leading authority on competitive strategy and international competitiveness. Michael Porter was born in Ann Arbor, Michigan. I like Porter's Five Forces model -- where can I read about it? Michael Porter published his work in his book called Competitive Strategy: Techniques for Analyzing Industries and Competitors. This book has been translated into 19 languages and has been named a best-seller many times. You can ask your questions about the Porter's Five Forces model in our management discussion forum.